What really makes the difference in chess is thinking ahead: learn to think first, and only then move. We are playing a Capture The Flag game. What are White’s choices? White could either capture the pawn on d5 or move his pawn forward to e5. Which one is the best? Which one will allow White to win? If White captures on d5, Black can move his e-pawn either one or two squares. 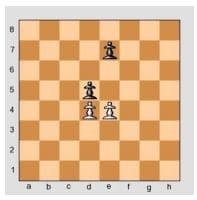 In each case White will be able to capture it and win the game. If, on the other hand, White moves to e5, Black will move to e6. White will then lose the game because he cannot make any moves. This simple game helps you to understand that it’s very important (and not just in chess) to stop and think about what will happen next before you do something. You should always try to think ahead: first, think what will happen after your move, and only then decide if that’s the right move or not.